Which is the Safest Cooking Oil? When I was growing up the ‘in’ oil for cooking was sunflower oil. My mum had a big plastic bottle of it next to the cooker and this was basically used for all cooking, while the extra virgin olive oil was kept in the pantry to be used for salad dressings. Today while you’ll certainly find whole sunflower seeds in my pantry, you won’t find sunflower oil. Neither will you find vaguely named ‘vegetable oil’ (this is a misnomer as no oil comes from vegetables, these are blended, refined oils, primarily extracted from seeds), rice bran oil or grapeseed oil. What you will find are a variety of different Australian extra virgin olive oils (AEVOO). These are basically the only oils I need for cooking, drizzling and dressing. The question has long been asked however about the safety of cooking with extra virgin olive oil, but what about other cooking oils? The real question we should be asking is; which is the safest oil to cook with? A few months ago, I wrote about cooking with extra virgin olive oil, but can now bring you the results from new Australian research comparing the following common cooking oils: AEVOO, olive oil (a refined blend), canola oil, rice bran oil, grapeseed oil, coconut oil, peanut oil, sunflower oil and avocado oil. The researchers ran two tests on the oils. In the first test the oils were gradually heated over 20 minutes from 25 to 240°C. This is generally much higher than you would cook in your kitchen at home, but is not uncommon in commercial kitchens. The second test was designed to see how stable the oils were over time. So, in this test they were heated to 180°C for 6 hours. When you heat an oil a number of chemical changes happen including oxidative damage to the fats present and a number of potentially harmful compounds such as polar compounds are formed. In a commercial kitchen where oils are used repeatedly, oils are regularly tested and if the level of polar compounds in the oil exceeds 25% the oil is deemed unfit for human consumption and no longer safe to use. So, what happened to the cooking oils during these two tests? Let’s take a look. Test 1: What happened when oils were heated? 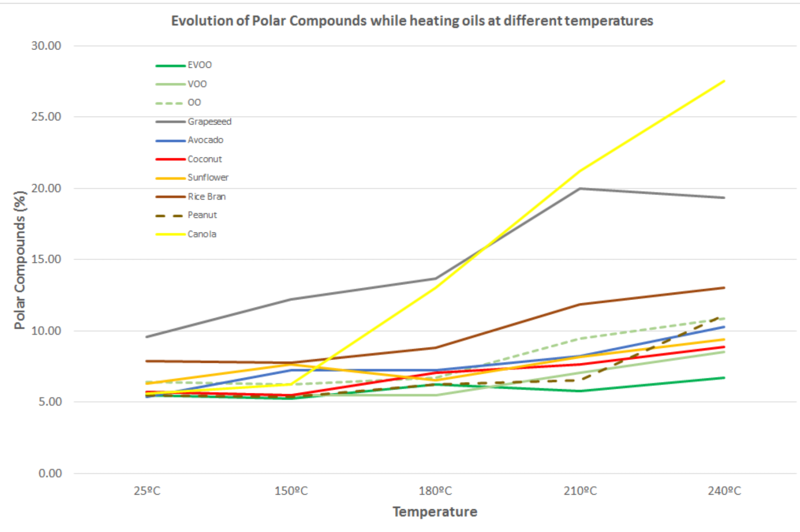 The graph below shows the percentage of polar compounds produced as the temperature increased. The grey line is grapeseed oil and the yellow line canola oil – both oils that are sold as healthier oils, particularly for cooking. Yet they performed the worst. 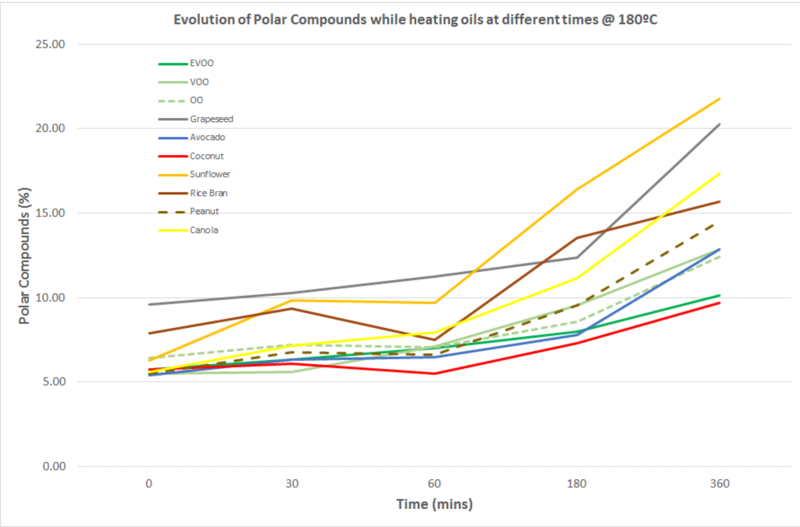 Both had a rise in polar compounds from the relatively low temperature of 150°C and by the time the oils reached 240°C the canola oil was well over the safety cut-off of 25%. Yet worryingly, this is a commonly used oil in industrial kitchens and in food production. The other oils all remained below the 25% cut-off, but you can clearly see that the AEVOO, the solid green line, performed the best with only a tiny rise. It was remarkably stable right up to 240°C. "The AEVOO, the solid green line, performed the best with only a tiny rise. It was remarkably stable right up to 240°C." Test 2: What happened to the oils when heated over time? The results from the second test, examining the stability of the oil over time, are shown in the graph below. Most of the oils were stable for the first hour, but over the next couple of hours there were big differences between oils. The worst performers here were sunflower oil, grapeseed oil, canola oil and rice bran oil. 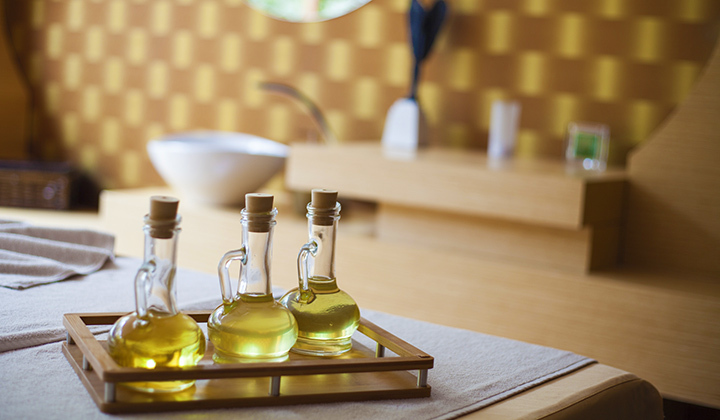 These oils also produced the greatest amounts of harmful trans fats. The best performers with the lowest level of polar compounds and trans fats were coconut oil and AEVOO. To date the smoke point of an oil has been used to indicate its stability, but the results from these tests contradict this. Grapeseed, sunflower and canola oils all have smoke points above 250°C, while AEVOO is in the range 200-220°C. Clearly the smoke point is not a good indicator of the safety of the oil under heat or over time. "Smoke point is not a good indicator of the safety of the oil under heat or over time." The key results from the two tests collectively were that AEVOO was the most stable of the oils tested, producing the lowest levels of potentially harmful compounds. Canola oil, grapeseed oil and rice bran oil performed the worst, producing the highest levels. "The key results from the two tests collectively were that AEVOO was the most stable of the oils tested, producing the lowest levels of potentially harmful compounds. Canola oil, grapeseed oil and rice bran oil performed the worst, producing the highest levels." Why is AEVOO so stable in cooking? AEVOO is remarkably stable because it has excellent oxidative stability, a very low level of polyunsaturated fatty acids and high level of stable monounsaturated fatty acids, it is naturally exceptionally high in antioxidants, which protect the oil as it heats, and it undergoes no refining – extraction of the oil is mechanical only. Good quality extra virgin olive oil is the safest and healthiest oil to cook with and here in Australia we are fortunately to have some of the best quality oil in the world. Not only is it stable to cook with, the antioxidants in the oil are well maintained and actually end up in the food you then eat where they can then have further benefit protecting cells in the body. "Australian extra virgin olive oil is the safest and healthiest oil to cook with." Disclaimer: I am a nutrition consultant and ambassador for Cobram Estate, an Australian olive oil company. I have researched the evidence behind oils and health for many years, leading to this role with Cobram. My job is to help disseminate this research to help us all make healthier food choices.